March 31, 1972, brought an unusual sight to downtown Toronto. An 1822 house, originally the home of Sir William Campbell, sixth Chief Justice of Upper Canada, moved from Adelaide and Frederick Streets in the old Town of York to its current site at Queen and University. It was the Town’s oldest remaining building. (Although The Grange behind the Art Gallery on Dundas Street dates from 1817, it was built out in the countryside, far from the few blocks of the original town.) Campbell House sat in an area now booming with condo development and rejuvenated warehouses, but then a run-down district where an old house just got in the way of a parking lot expansion. As I write this, we are celebrating Victoria Day weekend. Victoria herself was only 3 when Campbell House was built. Moving the house was quite a challenge as the following photographs show. Looking back at these pictures, I was amazed at how close the crowd following the move was to the building. In these days of Health & Safety Officers (with liability lawyers in close pursuit), the crowd would be kept back for blocks. This entry was posted in Looking Back, Urban Affairs. Bookmark the permalink. Reminds me of when we at the Toronto Railway Heritage Centre moved our steam locomotive from a parking lot at Exhibition Place to the John Street Roundhouse. It was difficult enough with all the clearance issues relating to the Gardiner, Streetcar wires and the Princes Gates but looking at the Campbell House move makes me think wow… that was simple compared to this. 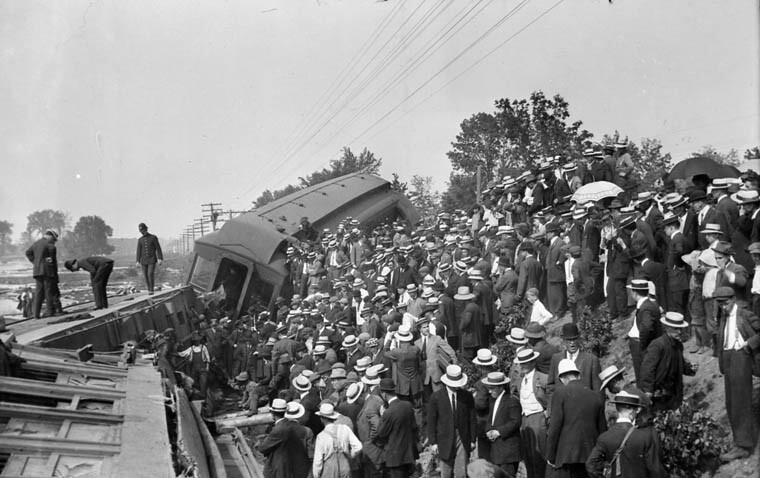 Regarding health, safety and liability: you have doubtless seen photos of railway accident scenes in times past, like this one. What an event! Looking at the (admitted rather small) crowds, I can imagine the excitement. Thanks for posting these photos and your narrative. I saw a picture recently of two little boys with their feet dangling over the excavation for the Yonge St. subway. These days must be recent because I seem to recall that the crowds were able to get fairly close during the Dempsey Brothers Store move up in North York before construction started on the Sheppard subway. I didn’t go downtown to witness this event although I was fully aware of it and followed it in the newspapers; for at the time I was an active member of the streetcar museum at Rockwood and the movers of Campbell House were one and the same Matthews Brothers who moved most of the streetcars out to Rockwood from day 1. In fact, the Matthews, Charlie and Roger, were instrumental in the acquisition of Rockwood Station (I don’t think the Directors of the OERHA were even considering a station until the Matthews suggested that they wanted one, “WELL DIDN’T THEY?”) as the two wanted the challenge to move something that large. The station filled Highway 7 from barricade to barricade with only inches to spare. Could that have been a practice run for Campbell house? The brothers had taken over the house moving business from their dad and you may recall their lot up in Thornhill. There the family had acquired a collection of railway and steam artifacts. There was a small witt car, #2806, (which eventually came to Rockwood as a source of parts and then the body became part of the restaurant in the McCaul Loop). a number of steam traction engines, some boxcars, a CNR steam loco and a few 0-4-0 tank engines. If memory serves they had had a three door trailer too, but it had been damaged beyond restoration with whatever materials had been stored in it. They were indeed a unique and talented pair. It was a delight to have worked with them as a Halton County Ry volunteer, moving cars for the museum’s collection. One move I recall had us bring two CPR boxcars down from the spur in Rockwood Village to the museum in less than 8 hours. I was a physically fit teen then, but those two, probably in their late 40s, were extremely difficult to keep up with. Now there’s memories. And as to Sir Campbell, he was responsible for at least two well laid foundations in this City. One, the house, and secondly the oldest Masonic Lodge in Toronto, St. Andrew’s #16. In the same year as the house, 1822, the lodge was established with Brother Campbell as its first Worshipful Master. A busy guy; new house, new lodge and the first Chief Justice of the fledgling Province. His lodge still exists and has some fun Scottish traditions still in practice; which happily I’ve been able to participate in. The members wear a sash of the Campbell tartan in memory of Sir William! Thanx again Steve. Well done and much appreciated. Fabulous actually heart-warming pictures. Cooperation; preservation, generosity and skill. Thanks for takings, and sharings.